A BYOD breakout room powered by Crestron. Over the past few years colleges, universities and corporations have adopted a more agile approach to meetings and working in groups. One of the ways companies are making this change is by implementing huddle rooms, which allow for more flexibility, and better opportunities to collaborate or to meet, whether it’s a decision making meeting or a group brainstorming session. Huddle rooms, or small conference and meeting rooms, are designed in such a way as to reduce the clutter, so to speak. These rooms are often smaller than a traditional conference room and feature a small table, and likely a flat panel display. Users can walk into the room, plug in to a cable cubby, or connect to a wireless display appliance and they are off and running in just a few seconds; certainly streamlined over a traditional conference room or boardroom setting. There are a number of available options when it comes to sourcing hardware, or software, for huddle room presentations. Seemingly every manufacturer in the switching and control market has a huddle room product, and from the number of press releases I receive on a daily basis, the quantity and quality of huddle room technology is only going to increase. Whether the application is for presentation, group study, collaboration, or even videoconferencing there is no shortage to the supply of huddle room solutions. When thinking about potentially outfitting a huddle room, there are solutions that run the gamut from simple plug-and-play options, to wireless technology, to small solutions that incorporate full control systems as well as videoconferencing capabilities. It’s imperative for technology managers to evaluate products not only on the quality of the technology, its consistency, reliability, and ease-of-use but also to make sure the solution meets the application. For an organization that uses huddle spaces sporadically, investing in huddle room systems that are costly and have extraneous features, for example room scheduling, might not yield the best ROI. Universities with Microsoft Lync might could greatly benefit from selecting a huddle room system that integrates with users’ laptops to provide video teleconferencing, whereas those without a soft-codec based VTC system might not get the same return. These are a few products that have stood out as viable solutions for any huddle room space, from familiar manufactures that will integrate well into any existing environment. We explain them in greater depth in the previous feature in our October Tech Manager's Guide. This is a small sample of the products available to help outfit a room with flexible huddle technology. Although huddle rooms are the latest technology, and aren’t going anywhere, for some organizations, technology managers must measure whether or not implementing huddle rooms at all—regardless of technology available—is the best fit for their organization. The ideal collaboration system of the future will support a variety of mobile devices, as well as digital and legacy analog signals. Extron says that its TeamWork solution was designed to meet any huddle room or collaboration need. 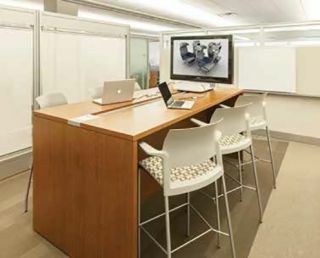 Huddle rooms are designed largely to operate with BYOD technology. A user brings their laptop into the room, sets it on the table and with a plug-in here and a few clicks there their content is displayed on the screen. This is exactly what huddle rooms are designed for—quick and easy presentation and collaboration designed to increase efficiency. For an organization which relies heavily on meeting spaces with a built-in AV operator, these rooms can be confusing, challenging, and ultimately won’t be utilized as frequently, limiting the ROI. How can tech managers deal with managing BYOD when we are still also using more traditional technologies, such as PCs? According to Tom Barnett, director of marketing communications at control technology provider Crestron Electronics Inc. in Rockleigh, N.J., in today’s meeting space, you need to be able to support all sources, including mobile devices and laptops. “Your goal ought to be that the user can get their content up onto the display, regardless of the device it’s on,” he said. Crestron has addressed this with its DigitalMedia distribution system, which manages both point-to-point wired and network-based wireless infrastructures. Its AirMedia component enables presenters to share content wirelessly with their laptops, tablets, or mobile phones. For organizations, which don’t regularly hold small, or stand-up, meetings a huddle, room might not be the best fit, either. Yes, the technology is great, easy to operate, and relatively inexpensive, but if there’s no need for the space, then there’s no need to buy the technology. For some organizations, presentations are only done to large audiences, and smaller, decision-making, meetings are often done in an office with no presentation capabilities. Designing a huddle room for an organization with these qualities would be akin to putting the proverbial cart in front of the horse. Technology managers: if your organization has decided to migrate from conference rooms towards more agile huddle spaces, there are endless options. But also know, just because the technology exists, doesn’t mean it’s the best fit for your organization. Mike Brandes, CTS, DMC-D, is a regular contributor to AV Technology.